A Grifolapine is a monster found in the Polypore Dungeon (fairy ring code BIP) on the third level. It requires a Slayer level of 88 to kill, and 60 Magic for the player to receive as a Slayer assignment. They are located in the third level of Polypore Dungeon. 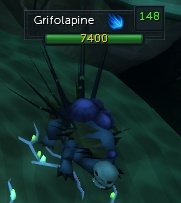 Grifolapines have similar drops to grifolaroos but have much better drop rates for grifolic flakes, the sought after item to create the grifolic set. In addition, they are the only monster that drops the grifolic wand and grifolic shield. The mushrooms on the platform can be used to hide behind to prevent toxic fungus damage. This monster attacks with Magic most of the time, so Protect from Magic/Deflect Magic will prevent most damage dealt. When using neem oil it will not attack with Magic anymore, but it will use its Ranged attack, hence using Protect from Missiles/Deflect Missiles can be used. It is resistant to Ranged and melee damage, so Magic would be the ideal method of attacking these creatures. These monsters never move when idle. They will only move when they say "Raargh! ", moving twice as fast as a player when running. Unless you are quick and use Neem oil instantly, you will take fungal damage. Their fungal damage does low to medium damage (50-150) rapidly. However, safespotting prevents this. If they are blocked, they will say *Sigh*, and resume attacking. Upon ending with *Sigh*, it skips 1 or 2 of its battle turns. Their relatively low damage also makes it useful to cast Soul Split on them, as the player hits higher than they do. Grifolapines shouldn't be far from their home platforms, unless someone has attacked them. Four grifolapines can be found in one of their grifolic-infested platforms. It may be hard to notice their Magic attack, because it looks as if a Grifolapine is idle. Their Magic attack hits harder and quite often, so it is best to constantly use Neem oil on them to prevent this. Note: Unlike most creatures that are weak to water spells, these are not weak against magic in general. The only way to effectively kill them is to use water spells. Other spells will miss about 80% of the time. Grifolapines are fairly easy to kill if you safe spot them, it would be advised to take some food just incase you need to heal. An experienced and high level player can easily finish a task in under 20 minutes, however low level players will have more of a challenge, so extra food is advised.